There seems to be a new tool from OhGodACompany called OhGodAnETHlargementPill presented in a bit funny and confusing way that does wonders for Nvidia-based GPUs with GDDR5X memory like GTX 1080 and GTX 1080 Ti for Ethash-based crypto coins. 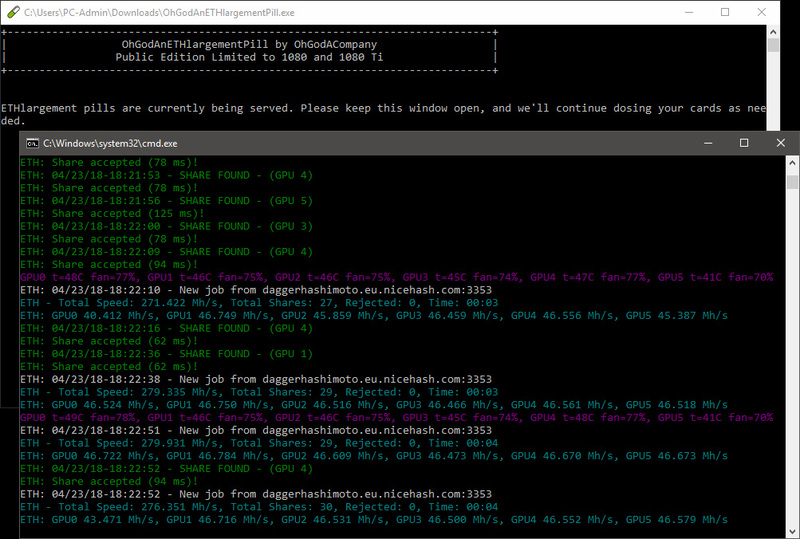 The “magic” tool is available for both Linux and Windows and all you need to do to increase your Ethereum (ETH) hashrate or that of another Ethash-based crypto coin up to about 50 MHS on a single GTX 1080 Ti (up to about 40 MHs on GTX 1080) is to have it running along with your miner. We have done a quick test with Claymore’s Dual ETH miner and got 46 MHS with power saving clocks on a mining rig with 6x GTX 1080 Ti graphics cards. So if you have Nvidia GPU mining rigs with GDDR5X memory (GTX 1080 or GTX 1080 Ti for now) you might wnat to give this tool a go and report your results in the comments below. And yes, the hashrate is higher not only locally reported, but poolside as well, so it is really working in boosting actual performance for Ethash mining. We are also seeing a decent improvement with Cryptonight as a memory intensive algorithm (more than 10%), so you might want to try with other algos as well and see if there will be extra performance gained fro this tweak.